Memo to those who are unsure whether global warming is real or affecting you: check your insurance bills. Here in Connecticut homeowners have seen their property/casualty rates increase an average of 35 percent over the past decade — twice the rate of inflation. In Rhode Island the overall increase is 55 percent. If you live close to the shoreline, it’s Katie bar the door. The insurance industry is just one example of decidedly non-liberal bastions that are taking global warming seriously. The Pentagon is another. While our Commander-in-Chief glories in a cold snap to mock the overwhelming scientific consensus that the world’s climate is heating up, the brass (of whom he is so fond) have been incorporating it into their planning for decades. But back to those pesky insurance bills. In the wake of Hurricane Katrina in 2005, states like Connecticut began allowing insurance companies to impose “percentage of value deductibles” on homes near the coast. Nineteen states now permit such additional customer liabilities, which can be as high as 10 percent. For example, if you own a $1 million home on or close to the ocean, instead of the more typical policy deductible of $1,000, you are liable for the first $100,000 in storm damages. Here in Connecticut the hurricane deductible is five percent of value and applies to properties within 2,600 feet (nearly half a mile) of Long Island Sound, as well as some areas further inland, such as towns on the lower Connecticut River. Our state is ranked tenth in the nation with the number of homes that have exposure to hurricane storm surge, according to the Insurance Information Institute. It lists 53,614 houses at risk here, worth a total of $35 billion. Let’s do the math: those swell dwellings are worth $650,000 each, more than three times the median price of a home in the United States. Homeowners also can get clipped by what the typical insurance policy does not cover: flooding. Residents in susceptible locations are advised to buy separate insurance for rising tides and overflowing rivers. But an estimated 75 percent of the homes in FEMA designated flood zones do not have it. In addition, FEMA maps are often out of date and don’t include areas that have become increasingly vulnerable to flooding in recent decades because of sea level rise, extreme rainstorms, and the expanding reach of ever more powerful storm surges. A federal program, the National Flood Insurance Program, provides below-market premiums for people living in harm’s way (where private insurers dare not tread). It is no surprise that this dubious entitlement, which used to be solvent, is now underwater to the tune of nearly $25 billion, adding to the federal deficit. Taxpayers in places like Kansas are helping to pay the insurance bills of the all-set set living in places like Malibu and Hilton Head. The rising cost of insurance is not only being driven by coastal concerns. There are unprecedented wildfires in places like California and super wind and hailstorms in states like Texas. In Connecticut, global warming means our climate is getting wetter and thunderstorms are becoming more severe, causing river and stream flooding and more frequent power outages. Insurance companies have been following weather trends for decades, and as the climate changes so have discernible weather patterns. What once were termed “100-year floods” now appear with alarming frequency. Houston recently endured three of them over an 18-month span. To chart the growing risk, insurers have thrown out weather assumptions from the good old days: 1961 to 1991. Those decades are now used as the baseline to measure how much worse things are getting. Companies have a plethora of external resources —quantifying our changing climate has become a growth industry— to help them keep up with these deteriorating meteorological times. 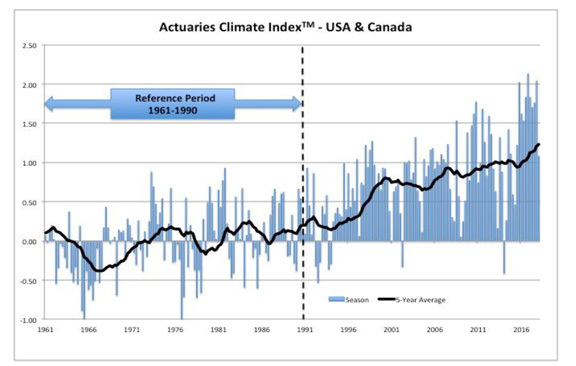 The Actuaries Climate Index is one example. It charts “changes in extreme weather” every three months and almost invariably each of its reports establishes a disturbing uptick in the six categories it watches, such as extreme temperatures, extreme precipitation, and changes in sea level. After one such recent report, it described its finding as reflecting “continued deviation of climate and sea level extremes from historically expected patterns” for the United States and Canada. To anyone who still thinks it’s all of a great big hoax, consider this: 2017 was the worst American hurricane season on record — thanks in large measure to storms Harvey, Maria and Irma— that is, until last year when the damages from the likes of Florence and Maria topped it. To make a long story short, unlike in the White House and the United States Congress, there are no global warming skeptics in insurance company boardrooms. Disappointingly, they are not vocal about what lies ahead. Nonetheless, they are quietly planning for the worsening of our climate by raising your premiums. Ignorance is not a viable option when profits are at stake. 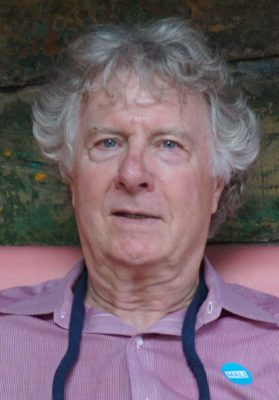 David Holahan lives in East Haddam.